Real Estate – CB Capital Research, Inc. Note: I know many of you reading this are either overweight cash or net short U.S. equities. Please don’t shoot the messenger: I am not personally biased to the upside – I am merely channeling what my models are telling me, and they are telling me to stay bullish. Tremendous bearish sentiment among second-tier and retail investors (which is bullish from a contrarian standpoint), including a spike in NYSE short interest, a spike in the AUM of Rydex’s bear funds, and several (second-tier) bank analysts making absurd price level predictions on oil and global risk assets (e.g. Standard Chartered’s call for $10 oil and RBS’ “advice” to clients to “sell everything”). I have previously discussed the construction and implication of the CBGDI’s readings in many of our weekly newsletters and blog entries. The last two times I discussed the CBGDI in this blog was on May 15, 2015 (“Leading Indicators Suggest Lower U.S. Treasury Rates“) and on February 10, 2016 (“Leading Indicators Suggest a Stabilization in Global Risk Asset Prices“). The latest reading of the CBGDI has continued to improve upon the readings which we discussed several months ago (see Figure 1 below)–just 10 days after we turned bullish on global risk assets. Both the 1st and the 2nd derivatives of the CBGDI have continued to climb and are still in (slight) uptrends, suggesting a stabilization and in some cases, a re-acceleration (e.g. the economies of South Korea, New Zealand, Spain, and India) in global economic activity. So don’t shoot the messenger–but it appears that the rally in global risk assets coming out of the late-January-to-early-February bottom still has more room to run. Long-time readers will know that I (Henry) have been advocating a consistently bullish position on the U.S. economy, citing the U.S. energy production renaissance, the technology revolution driven by additive manufacturing, cleantech, and finally the general adaptiveness of the U.S. entrepreneurial class and capitalist system. We have been especially bullish on U.S. commercial real estate. While commercial and multi-family real estate prices have risen substantially in prime, “trophy” markets over the last 12 months, we believe there remains numerous investment opportunities in the non-trophy areas–i.e. properties that have not been sought out by international investors. Specifically, much of the CMBS originated during the bubble period of 2004, 2005, 2006 and 2007 will be maturing over the next four years. As shown in the chart below, approximately $500 billion of CMBS will mature during 2014-17. 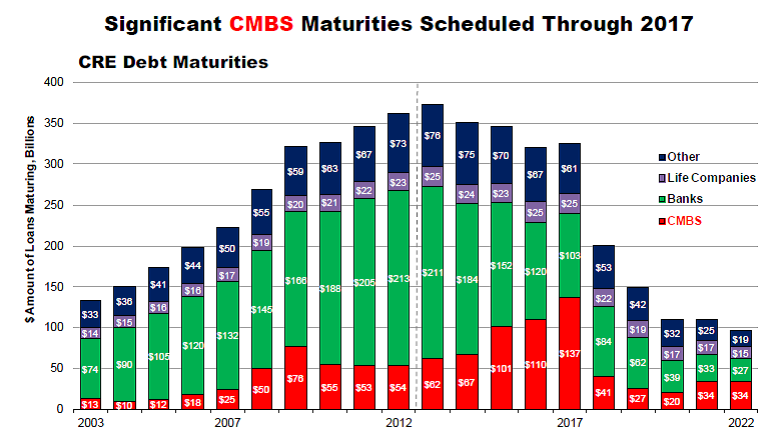 Given the aggressive underwriting standards during 2004-07, much of these maturing CMBS will not qualify for refinancing. In other words, there will be significant forced selling of U.S. commercial real estate properties over the next four years. We believe such forced selling represent a once-in-a-generation buying opportunity for clients looking for steady cash-flowing properties and as a hedge against future inflation or US$ devaluation. Investing in U.S. commercial real estate or multi-family housing is a sound strategy for a wide variety of investment or economic scenarios, especially in a world experiencing significant social and economic change. The decades surrounding the turns-of-the-century have typically ushered in revolutionary change. e.g. A person who fell into a coma in 1790 and woke up in 1820 would no longer recognize the world. France has lost its dominant position as a European power, while England began its empire-building ambitions. After the War of 1812, the U.S. cemented its position and was no longer a fragile republic dependent on England. Similarly, a person who fell into a coma in 1890 and woke up in 1920 would find himself utterly confused. The U.S. replaced England as the world’s dominant industrial power; Europe’s map had been reorganized and many of the 19th century empires no longer existed (e.g. Austria-Hungary and the 2,000-year old Chinese dynastic system). 37 million perished during WWI, while the terms of the Treaty of Versailles would sow the seeds for WWII. Trust companies, such as Standard Oil and American Tobacco, were busted, while the Federal Reserve sprang up among the ashes of the Panic of 1907. Fast forward to 1990. A person who has been asleep in the last 23 years would not recognize the world today. The Soviet Union, our greatest enemy, no longer exists. Japan, slated to become the world’s most powerful economy, is no longer (that) relevant. Instead, China is now regarded as America’s greatest competitor. In 1990, India’s economy was close to collapse–today, it is the world’s 9th largest economy–just behind that of Italy and ahead of Russia. Instead of an Indian bailout, the world bailed out Greece, Ireland, Portugal, and Spain. Italy came close to needing a bailout–an unimaginable scenario just a decade ago. We are also enjoying a new domestic energy revolution, driven by productivity in shale drilling, horizontal drilling, and Lower Tertiary drilling. Solar is already replacing base-load power generation in Germany during a sunny day. By 2020, California will source 33% of the state’s energy from renewables. On the other hand, there remains significant, new challenges to the U.S. economy and society. Overall debt levels remain high, while unfunded liabilities–in the form of future retirement and healthcare benefits–will bankrupt some developed countries if they are not curtailed (the present value of unfunded U.S. Social Security and Medicaid benefits is more than $60 trillion). Unless we implement more efficient healthcare cures and delivery services, we will inevitably default on these benefits–through more stringent eligibility requirements, inflation of the U.S. dollar, or outright default (Detroit is going through this as we speak). In other words, both the U.S. economy and society will undergo significant fundamental changes over the next 5-10 years–for good or for ill. We thus recommend a barbell investment strategy over the next 5-10 years, i.e. selective risk-taking while employing a sound capital preservation strategy (contact me for more info). We believe our recommended position in U.S. commercial real estate or multi-family housing is a very attraction option on either end of the investment barbell, i.e. it should do well in the vast majority of different scenarios we could possibly imagine–either significantly higher inflation or a society transformed by clean energy and automation (e.g. self-driving cars). The maturity of approximately $500 billion of CMBS–which will trigger significant selling from motivated sellers during the next several years– is thus a perfect opportunity to purchase commercial real estate or multi-family housing to take advantage of these fundamental, macro trends that we foresee over the next 5-10 years. In our June 13, 2013 newsletter (please email us for a copy), we asserted that–after six years of U.S. household deleveraging–the confluence of many forces, such as growing U.S. energy independence, rising housing prices, and an improving private sector labor market, suggests U.S. consumer spending growth is still early in the cycle. According to the BLS, the number of U.S. employed aged 16+ (seasonally adjusted) peaked at 146.6 million in November 2007. This fell to just 138.0 million at the December 2009 trough, i.e. the U.S. lost 8.6 million jobs during the recession. As of August 2013, the number of U.S. employed aged 16+ has recovered to 144.2 million. Since the beginning of 2013, the U.S. had added nearly 900,000 jobs, after adding 2.4 million jobs in 2012. Perhaps more important, the U.S. private sector has been driving most of this job growth. Assuming the private sector (which has recovered over 80% of its jobs lost during the recession) sustains its current growth rate, the U.S. economy is less than a year away from recovering all of its private-sector jobs lost during the recession. Yes, it did take four years, but we are making progress (e.g. the U.S. auto industry is operating at near full capacity and is embarking on a hiring spree). From CB Capital’s vantage point, we are witnessing significant innovation and business activity among our tech clients–from Pasadena to Santa Monica to Orange County–all the way to San Diego. In our opinion, there is no question that U.S. tech and innovation will continue to lead this U.S./global economic recovery. The Schumpeterian forces driven by the U.S. capitalist system (yes, this does exist in California) is alive and well. As an aside, the sectors that led the last bull cycle, such as Emerging Markets, fossil fuels, precious metals, U.S. financials, etc., typically experience muted activity in the next bull cycle. This is not surprising. I first became bullish on gold and silver in late 2000–purchasing physical and mining stocks when they traded at $275 and $4.50 an ounce, respectively. This decision was driven by many factors, including the sustained lack of mining infrastructure investments, the Greenspan-led monetary easing policy, the downright hatred of precious metals as an investment, and both central bank selling and production hedging (short-selling) by major precious metals miners. Since late 2000, all of these trends–with the exception of global monetary easing–have reversed. A similar scenario has transpired in the fossil fuels industry, when I first became bullish on oil in August 2004. There are no prizes for following the herd or coming in last. and investors should not make–and do not deserve–outsized returns by investing in industries that have already enjoyed a decade-old bull market. Make no mistake: The next trend is in U.S. tech and innovation. The world can only innovate and increase productivity through the forces of Schumpeterian growth, aided by the U,S. capitalist system and uniquely intelligent entrepreneurial, and risk-taking spirit. Our recent work with clients in the UAV, video gaming analytics, online real-time bidding, and software-defined networking space have further convinced us of this case. Much of this growth will be driven by tech entrepreneurs near the campus of Cal Tech, the area around Santa Monica (a.k.a. Silicon Beach), and all the way down the I-405 to San Diego. This bullish cycle in U.S. tech (better 4-D seismic equipment and drilling technologies are responsible for much of the recent increase in U.S oil production) is a strong counter-force to U.S. consumer deleveraging. Along with ever-increasing domestic oil production, U.S. tech will lead the recovery of the U.S. private sector, as well as global economic growth. Aside from a recovering U.S, private sector, perhaps one of the most encouraging signs for U.S. consumer spending growth is the state of U.S. household balance sheets. One of the main themes we have tracked since the early 2000s is one of the overleveraged U.S. household–and since early 2007–the inevitable deleveraging resulting from the housing crisis and the subsequent decline in household credit growth. 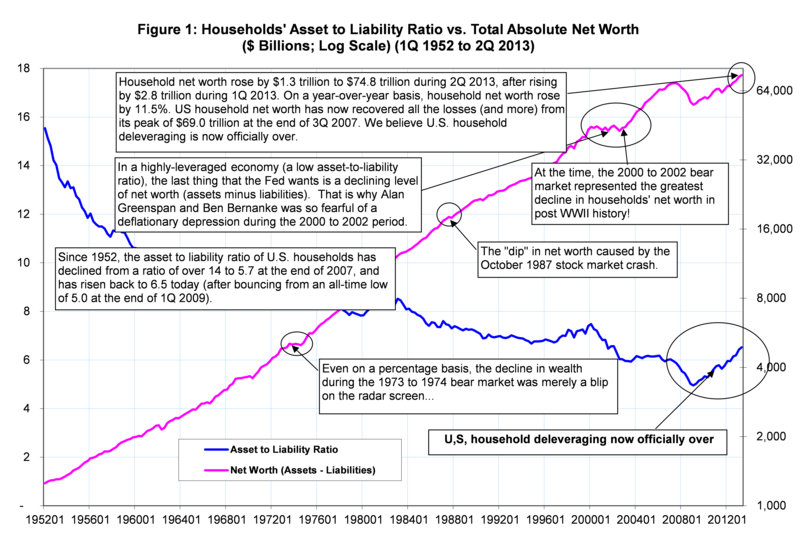 As shown in Figure 1 below, the asset-to-liability ratio of U.S. households experienced a secular decline (i.e. U.S. households went on a credit spree) from over 14.0 in the early 1950s to just 5.7 at the end of 2007, and then to a post WWII low of 5.0 at the end of 1Q 2009 as the global financial crisis peaked. After endless rounds of global monetary easing, asset purchases, old-fashioned economic growth, and household/government deleveraging over the last five years, the asset-to-liability ratio has risen back to 6.5 at the end of 2Q 2013–its highest level since the end of 1Q 2002! Moreover, U.S. household net worth hit another record high of $74.8 trillion–$5.8 trillion higher than the pre-financial crisis peak of $69.0 trillion set at the end of 3Q 2007. In other words, the balance sheets of U.S. households–despite anemic job growth and the prolific growth of student loans (now over $1 trillion outstanding)–are now in their best shape since early 2002! The “wealth effect” from this benign trend, as well as ongoing U.S. job growth, should provide a strong tailwind for further growth in U.S. consumer discretionary spending. Timing, of course, is everything. History suggests that this ratio could rise even further. Should this occur, then U,S. household deleveraging (and a renewed cutback in consumer discretionary spending) may not be over. We are of the opinion that such fears are overblown. Firstly, much of the extraordinary growth in U.S. household debt over the last 20 years occurred in the housing mortgage sector. Indeed, for every percentage growth in U.S. household assets since 1952, U.S. households incurred 2.67 times as much mortgage debt, compared to 1.93 times of all other household debt. 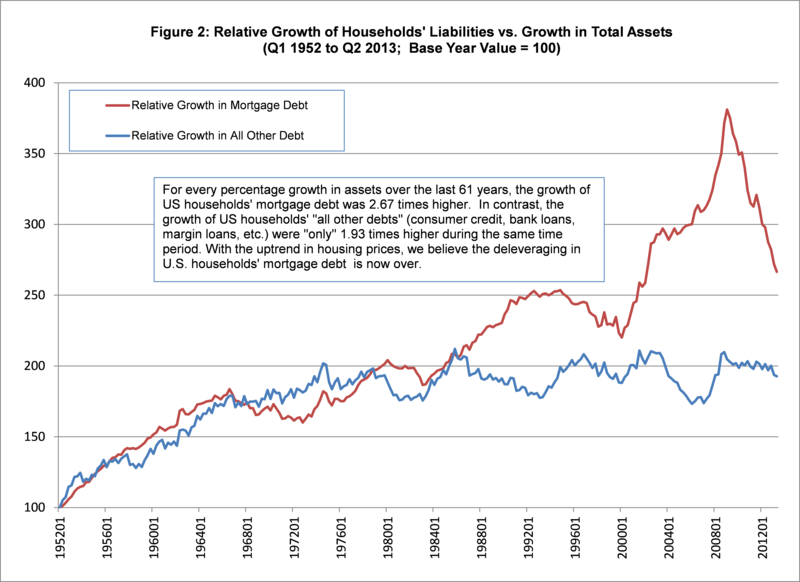 Note that mortgage debt growth as a ratio of household assets growth is down from a peak of 3.81 times at the end of 1Q 2009, due to rising home prices and significant write-downs of mortgage debt over the last five years. 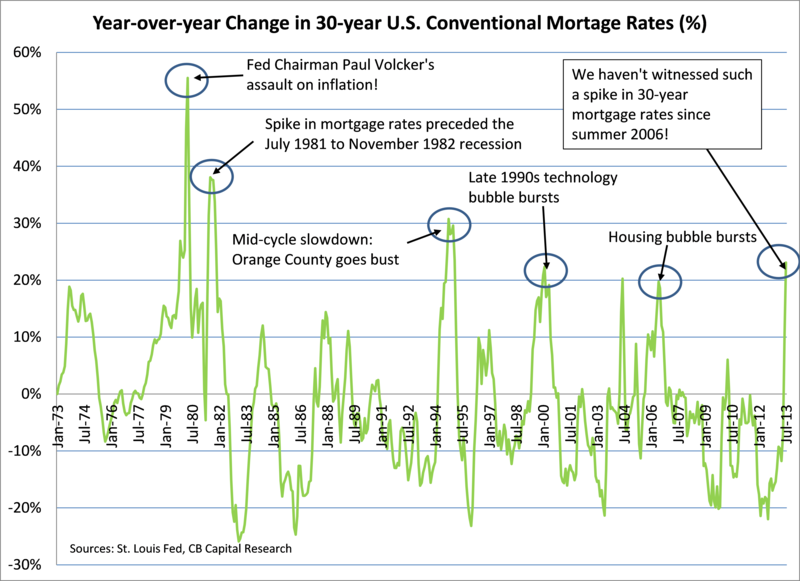 Moreover–despite rising mortgage rates–US. housing activity and prices are maintaining their positive momentum. For example, over the last 12 months (ending July 2013), the Case-Shiller Index for 20 major U.S. metropolitan areas rose 12.4%. Given ongoing U.S. job growth, rising U.S. energy independence (U.S. domestic production has risen another 1.3 million barrels/day over the last 12 months), and recent easing of bank lending standards, the positive momentum in U.S. housing activity and prices should last well into next year. Because much of U.S. household debt growth was incurred in the mortgage sector, a rising housing market would significantly reduce the probability of a renewed deleveraging of U.S. household balance sheets. In addition, the build-up of U.S. household balance sheets would also reduce the number of households underwater in their mortgages. Such a benign trend will further support consumer spending, as well as reduce U.S. systemic risk. We have no doubt that U.S. consumer discretionary spending is still in the early stages of a sustainable upward trajectory. U.S. corporations and consumer brands (with the glaring exception of J.C. Penney) will realize this by early 2014, and will then take advantage of this trend through store expansion, differentiated marketing, investing in new products, and a sustained round of new hiring. Note: In our July 31, 2013 post (see “Our Revised 12-Month Outlook on Major Asset Classes“), we downgraded Developed Equities from a return rating of “5” to “4.” Since then, the Dow Industrials and the S&P 500 have declined by 4.4% and 3.1%, respectively. Meanwhile, our upgrade of Emerging Markets was based on valuations. With the exception of India, Indonesia, and the Philippines, EM equities have done okay (Chinese equities have risen since July 31). Note that in general we never advocate any long positions on the weakest links–those being India, Vietnam, and probably Indonesia right now. Please also note we will also never advocate any substantial long positions in an asset class that led the last bull market. E.g. We did not advocate much buying of tech stocks during the 2003-2007 bull market. Rather, we advocated the purchase of precious metals, commodities, etc. As a rule, the asset classes that led the last bull market (those would be U.S. real estate, U.S. financials, EM equities, and commodities) typically under perform in today’s bull market. Already–based on our deal flow and conversations with clients–we are seeing green shoots and revolutionary, but practical breakthroughs in the U.S. technology sector. We believe U.S. tech will lead the current bull market to new heights over the next several years. In the meantime, both U.S. and global equities are undergoing a corrective phase. Based on our proprietary technical and sentiment indicators (which we will cover in latter commentaries), they are still not close to a buying point. We expect this corrective phase to last another 2 to 3 months. We also expect the U.S. and global economy to slow down for the rest of the year, given increasing anxiety over the uncertainty of U.S. monetary policy, the change in the Fed chairmanship (most likely, Lawrence Summers will head the Fed, which will not be constructive in the short-term), and uncertainty over the Chinese and Indian economic slowdowns. We believe U.S. real estate–despite its recent positive momentum–will suffer a slowdown as global investors pull back, and as U.S. interest rates continue to rise (this morning alone, the 10-year Treasury rate spiked by 15 bps to 2.9%). Since the beginning of this year, we had given a return rating of “9” to U.S. commercial real estate–our most bullish return rating this year thus far. Both U.S. commercial and residential real estate prices have significantly over-performed this year–reaffirming our bullish view. Keep in mind, however, that our bullish outlook on U.S. real estate was predicated upon: 1) ongoing monetary stimulus, 2) severely oversold valuations and dislocation in U.S. real estate, 3) an undervalued US$, which generated significant foreign interest, 4) a re-allocation by institutional investors (e.g. pension funds and sovereign wealth funds) to U.S. real estate from other global risk assets. Given the heavy investment activity and the rise in U.S. real estate prices this year, we are no longer as bullish. In addition, the recent spike in interest rates, including the 30-year mortgage rate, is generating significant concern among CB Capital. The recent spike in the 30-year mortgage rate (on a % basis) is the most severe since the spike during summer 2006, which preceded the bursting of the U.S. housing/mortgage bubble in 2007. We are not as concerned this time around (we went short U.S. equities in late 2007) as the U.S. housing market–unlike the typical post WWII economic cycle–did not lead the U.S. recovery over the last several years. However, the history of the above chart cannot be ignored. As such, we are downgrading our return outlook on U.S. commercial real estate–from a “9” to “8,” and increasing our risk rating from “5” to “6.” We would also not be surprised if some kind of financial “dislocation” emerges in other parts of the world, such as India, Vietnam, or even the Euro Zone. The last time we witnessed a combination of spiking interest rates and Fed uncertainty (i.e. 1994), Orange County filed for bankruptcy, and many investment banks and hedge funds lost substantial amounts betting on the carry trade. Investors should dial back risk-taking in general for the next two to three months. Since the Japanese stock market and real estate bubbles popped in 1990, one of the surest ways for a portfolio manager to get fired is to go long Japanese stocks or real estate. ROEs on Japanese companies are among the lowest in the world; while Japanese real estate prices had been mired by a 23-year secular decline. There were massive policy failures–including building “bridges to nowhere” and the infamous consumption tax hike from 3% to 5% in 1997–just as SE Asia sank into a depression. While Japan’s policy rate was eventually brought down to zero, it came too little, too late. High-ranking BOJ officials eventually stopped attending the annual Jackson Hole Economic Policy Symposiums simply because they did not want to be ridiculed by other central bankers. All this changed tonight. The Bank of Japan just announced it will double its monetary base over the next two years, as well as embark on a massive quantitative easing policy with an annual goal of 50 trillion Yen (US$538 billion) in JGB purchases. Consensus going into the meeting was in the order of an annual 15 to 20 trillion Yen in JGB purchases. A US$538 billion QE policy is massive, as Japan’s economy is less than 40% the size of the U.S. economy. Essentially, the BOJ will be purchasing JGBs at the rate of over 9% of its GDP every year. An equivalent QE policy in the U.S. would be in the realm of nearly US$1.4 trillion in Treasury purchases on an annual basis. The policy implications are massive. For one, no living portfolio manager had ever been surprised by the BOJ in such a manner. Surprises have been many, but those have all been disappointing. The Yen is down by 1.1% as I am writing this article. We expect more competitive currency devaluations and supressions by other Asian central banks in 2013 and 2014. Such a move will no doubt generate a massive rise in global liquidity–which will drive up the prices of risky assets around the world. For two, we know that Japanese households have continued to hold massive amounts of cash and deposits due to ongoing deflationary fears and general aversion to risk-taking. 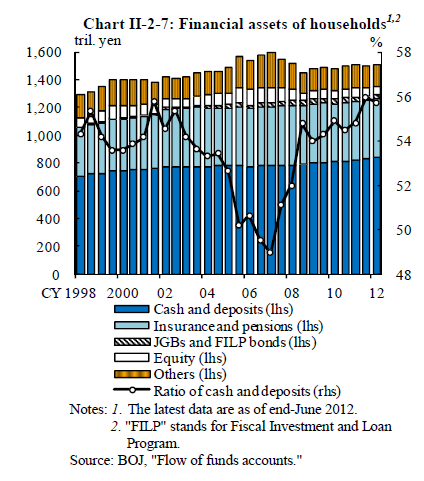 According to the BOJ’s Flow of Funds, Japanese households held nearly 800 trillion Yen in cash and deposits as of June 2012, or nearly US$8.6 trillion (see below chart). With a yield of 0%–and with the BOJ now hell-bent on a 2% inflation target–many Japanese households will no doubt start deploying their capital back into higher-yielding or riskier assets. A mere 10% shift out of cash into riskier assets would mean a wall of liquidity totaling nearly $900 billion. Keep in mind that this amount is equivalent to the sum total of ALL U.S. equity/hybrid/bond mutual fund inflows (totaling $913 billion according to ICI) during the peak tech bubble years from 1997 to 2000! We thus expect global risk assets–especially U.S. stocks and U.S. commercial real estate–to be driven significantly higher by Japanese inflows over the next few years (to be compounded by Chinese inflows as the Chinese capital account is liberalized). All corrections from hereon should be bought. Happy New Year. 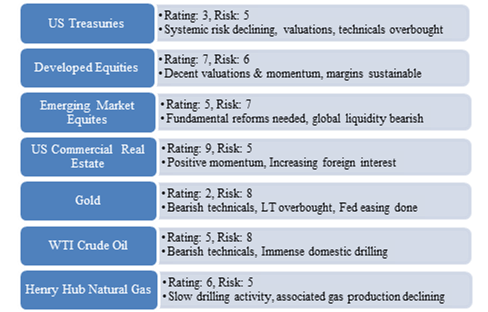 Following is our 2013 price and risk outlook for selected major asset classes. We are publishing our annual price and risk outlook for the first time, so a little explanation is required. Our rating score summarizes our view on where we believe prices will head over the next 12 months. A rating of “5” is considered neutral–close to the asset class’ historical median return. Our risk score summarizes the probability for significant deviation from our price outlook. 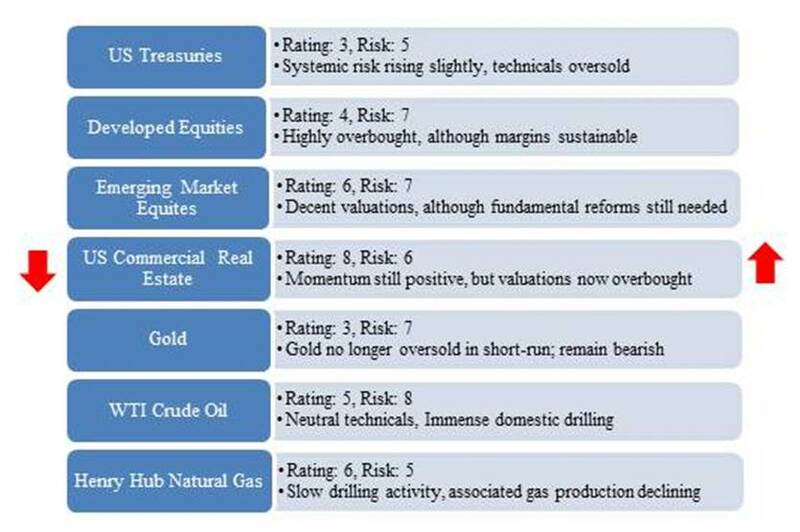 For example, gold’s risk score of 8 suggests the significant possibility that the asset class could remain elevated near $1,700 an ounce (as opposed to our downward forecast), as the price/demand of gold depends on many differentiated factors, such as jewelry demand in China and India; as well as a reemergence of systemic risk in peripheral Europe. The outlook on global monetary, fiscal, and global bank regulatory/lending policy is anything but certain in 2013. More details will be provided in our CB Capital’s inaugural monthly newsletter. It will be published in the next 7 to 10 days, and will be provided to selected clients. All the best for 2013.